Three is a crowd in our current voting system. Plurality voting, where the candidate with the most votes wins, is dysfunctional when more than two candidates run. It promotes zero-sum politics that discourage new candidates, suppress new ideas and encourage negative campaigns rather than inclusive efforts to build consensus. In contrast, instant runoff voting (IRV) elects candidates who have majority support, accommodates voters having better choices and encourages winning candidates to reach out to more people. Join with us to seek IRV to elect our top local, state and national leaders. 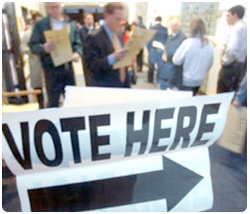 FairVote's IRV America program advances IRV through research, outreach and advocacy. We assist in every step of what it takes to implement IRV from initial community education to researching past elections and laws, advising campaigns and assisting implementation. We also help with increasing understanding of IRV through its use in student elections, online voting and much more.